We are currently drinking "India". But "Platinum Blonde" will do too. Half Caff, Decaf, Brazil...We have our favorites, but its all good. Gimme! Coffee! Gimme! is an Ithaca based coffee company with shops in Ithaca, Trumansburg, Cornell Campus (in a beautiful retro silver camper--airstreamesque...but not airstream)and Williamsburg (NYC). Their coffee is great. Their passion for great coffee is greater. Gimme! is part of the buzz here in Tburg. Its the place one hops in for a cup of coffee and leaves an hour and half later after catching up with a half dozen neighbors doing the same thing. Gimme! is at the Corning Museum of Glass. Their wholesale business is good. And the good news recently announced was that they are going to set up their "back of the house" roasting in Ulysses (Krum's Corners Road)--which is great for us who live up here as its new and solid business adding to our interesting, very local mix. 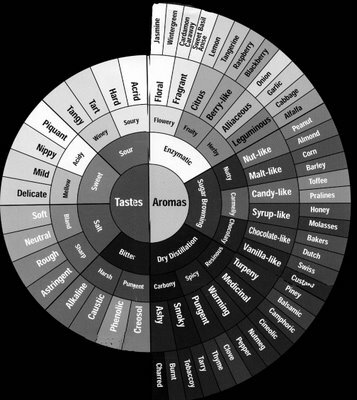 This tastewheel is from a coffee site: http:www.sweetmarias.com.Seems that Maria is way into coffee, roasting (and the various methods you can do it)and and selling the gadgets etc. to make wonderful coffee. I couldn't resist this tastewheel because it is so nice that everything fits so neatly into a graph. Maybe this is the way to build an artist's statement?